I'm not entirely sure you can read this bit of unintentional humor that Frank Thomas has sewn into the pants of my cheap riding suit. But motorcycle gear makers, listen up. Here's a tip. 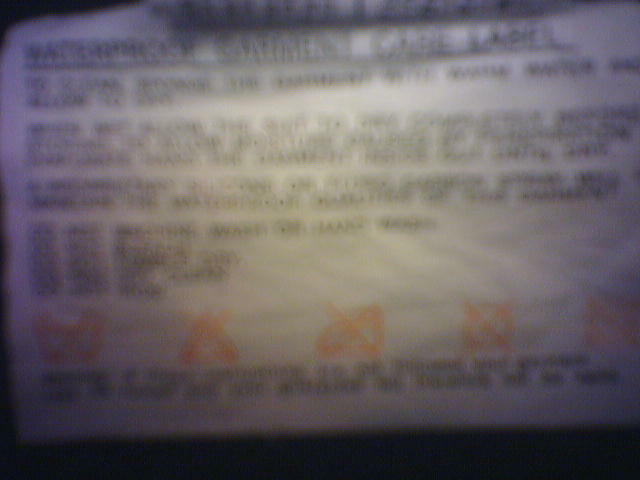 If you want women to heartily endorse your products, do not put phrases such as "allow moisture caused by perspiration to evaporate" and "do not machine wash or hand wash" on the tags of them. In fact, those phrases might not be terribly appropriate on garments for either gender. So, while following some Boing Boing links this morning I came across a posting for the most unfathomable and frightening thing I've ever seen: toilet bowling. Not even the pun on the term 'toilet bowl' could save it. It was truly bizarre. Had to be made up. So, being me (and my final being in like an hour, so why study) I had to follow the links and verify that it was false. You will all be pleased that the world is safe, for there was no mention of toilet bowling on the originator's site. Instead, they moved it upscale with toilet golf. Somewhere, someone who loves humanity is weeping. Today as I left classes, it hit me that I would not be returning to school in the fall. Not at CSM. Not at SJSU. I'm done. I've been fighting this realization for over a month, but this week it came to a head. I don't have the strength to keep fighting it and I'm just heartsick from the effort. So I'm done. I'm also done with Lee's. I am sick of waiting for the turnaround that's never going to come. Tuesday it was made clear to me, intentionally or not, that there is no place for me in the new order when the fallicious revolution comes. Mark slipped up when we were talking on the phone. After years of loyalty to him, I am not considered part of his team. Cest la vie. This is what I get for my love of underdogs. So, its time for me to start looking for another dead end job. I figure if I start now, I've got six weeks to try to find one that isn't embarassing before I'm reduced to competing with 20 year olds to man the counter at Borders. Joy. Know anybody who's hiring? A few weeks back (maybe a few months, a lot of time is running together this spring I've found), I built a DIY set of steps up to the first retaining wall. I had the imagined bliss of sitting on them come summer and enjoying- ok, probably not enjoying my back yard, but being less irritated by it at any rate. This was also while Tony was in Ohio and I needed something distinctly physical to do to take my mind off things. Tony came home and- to his credit- noticed the steps immediately. They are off in the corner of our yard, and just below the sight level from the kitchen sink. But he was a good husband, and complimented me appropriately for I am very proud of my shabby contractor skills. Well, I got another compliment today. While rinsing dishes for the dishwasher, I noticed that Abby was standing on them to reach the branches of a neighbor's tree. The steps might have been below the sight line, but the four foot deer perched upon them was not. (Yes, Abby is a deer. And my favorite blue jay is Leno. I have had too many rats to be allowed to come up with names on the fly anymore.) I watched her gracefully strip Darryl's tree for quite some time. It was very cute, because she would rear up on her haunches on the steps in order to devastate more of my neighbor's flora. I don't care. I grow animals much better than I do plants. Even in my back yard. Oh, my. What a nifty link I found on Boing Boing this morning. Books in PDF format. Now I have been known to indulge online, particularly when I'm looking for things that I know will be somewhere in the people's hands by now. You know, like Beatrix Potter or such. But Planet PDF has gone above and beyond expectations. I started chortling just looking at it. All those books and I don't have to go figure out where I stashed the hard copy. They will be mine. MINE, I say! It's cold and grey and I just don't want to go to class tonight. I don't think I've ever been so glad to see the end of a semester. Only seven more days. While we were running about the paddock cheating on our bikes at the hands of all those shiny new ones, we started sitting on BMWs, which I think is a great joke since I need a leg up on most of them just to get to the footpeg. In the midst of this Tony points to the biggest beefiest boy and says "That one was Jim's." It was a monster, clearly four times the metal of mine. Yesterday, as we pulled into the lot, we were nosed in closely by a lot attendant who evidently worked at SFO during the week. He had us in there with amazing precision I wondered if he had preset the placement with a micrometer. I was mentioning this to Tony when the bike parked less than two feet behind mine started dropping a lot of fluid. I mean raging torrent. The only time I ever saw that much was when I blew a radiator hose from a v-6 engine. (I know you remember that, Lila.) Yowsah! Just as I started calmly shrieking at the man that there might be some sort of problem with his bike he turned to look, freaked for a second, then grabbed the bag off his seat. Which turned out to be a camelback, whose reservior was emptying down under the seat and across the machinery, causing the illusion of engine death. drunk tourists hitting the wineries anyway. So, in we went. I headed straight for the Icicle booth as I'd managed to lose both pairs last fall. This was tragic as they're the only brand I've never been able to destroy. I've been able to get by this winter because my Nolan helmet has a tinted pull down visor. But spring is here, and California sun is incredibly bright. New sunglasses were a priority. Unfortunately, they didn't have the red frame/lense ones I lost. So I wound up with blue/blue instead. making the paddock a bit spartan, but that's a small defect in my book. After the races, we headed to Novato for their bike night. It was nice. A low key version of Cannery Row. I do wish we had friends who got into that sort of thing, as its just not as much fun without knowing people there. In Monterey this is alright, since we get stuck in a crowd anyway, and it takes quite some time to go down the entire length of bikes. But Novato was only a few blocks long. Three, I think. And it was a bit odd, since Novato has cute feminine-esque shops where Monterey has touristy ones. The dicotomy of the bikes against the high-end lingerie and girlie bric a brack was wonderful. We ran into Deb at dinner. I was wondering when that would happen as we run into her every race. But I'm about 85% sure she can't remember who I am so I always get self conscious. She told us that tires seemed to be the culprit in Honda's Supersport run. As we were coming back to our bikes, I saw two guys admiring Tony's bike. I have to say, I'm a little saddened, as it used to be my bike that got the attention. Not so now there's a Tuono in the family. A little while later, Tony asked if I had put something in his helmet. No. So he pulled the object out. It was a nice long sleeve Aprilia shirt. The reps had been out stashing them in the Aprilias they found on the row, and we had fun finding where they had hidden them on other bikes.